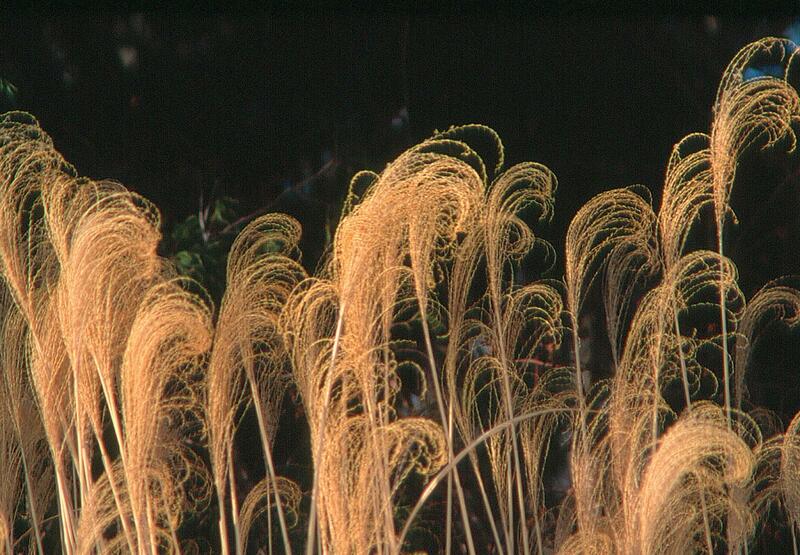 LIGHT: The seedheads of this perennial grass resemble golden feathers when lit by the late afternoon winter sun. Perennial grasses add year round interest to garden pictures and are remarkable for their ability to reflect light in every season. When I started taking pictures of our garden several years ago, my single purpose was to capture the plants in bloom - much as a hunter sets out to capture his prey. Today, I consider my camera my most useful and valuable garden tool. Through the lens of the camera, a new way of seeing the world was revealed to me. I learned to look through, within and beyond whatever is before me in search of that perfect ray of light. My goal is to capture the light as it settles on the flat, daisy-like shapes in a meadow on a summer morning, or as it sparkles through the silvery inflorescence of a perennial grass in the warm autumn sunlight. This way of observing our world, and specifically the plants in our landscapes dramatically shaped my appreciation of design. Many experts recommend using black and white photographs to study the effectiveness of a design. Without the distraction of colour, the proportion, scale, form and texture of the plants each take on a new importance. Structure is everything when a garden is seen in varying shades of grey. My experience in using black and white photographs to illustrate newspaper articles taught me many valuable lessons in this area - a substantial rock, wooden obelisk, cobbled pathway or dry stone wall add strength to a composition as if anchoring the plants. In the same way, plants that are thoughtfully organized according to their form, scale and texture will also be effectively reproduced in a black and white shot. A planting rich in colour but lacking in form will appear flat and lifeless in monochrome. LIGHT: Long, dramatic shadows cast by this alley of trees seem to dance on the crisp snow adding excitement to this winter garden scene. MOTION: Fluffy heads of Pennisetum alopecuroides 'Hameln' sway gracefully when stirred by gentle summer breezes. Their arching form and buff colour show to advantage over the groundcover of burgundy coleus. WATER: Still water mirrors the buildings and colours of the sky and clouds giving a serene look to this Italian town. To really see which combinations work best, you must develop a sort of sixth sense when looking at our world. When I head out with the camera over my shoulder, I try to observe a garden with this heightened sense of vision. For example, study the water in a stream. Although the water may be dark and sombre at first glance, look at it carefully. It mirrors the movement of the clouds and reflects the colours of the sky. Below the water's surface, grasses seem to sway as they follow the movement of the current. The slightest breeze will ripple the glassy surface. A cloud crossing the path of the sunlight will suddenly darken the character of the water. A mature tree will also help to train your eye. A tree seldom sits still. Sunlight dances through the leaves, creating pretty dappled patterns overhead and on the lawn below. In midsummer, the leaves are a soothing, cool green, and by autumn they resemble a warm, golden canopy. Leaves stir with the slightest encouragement from the wind or the movement of a mischievous squirrel. As the leaves fall in autumn, they drift silently on the wind, each giving a little thump as they make their final landing. The structure of the tree, whether it is a bold oak or a finely textured Japanese maple, adds stark beauty to the winter landscape. Your eye can be trained to seek out rhythm in the landscape as well. Rhythm is established by the regular recurrence of qualities or conditions. The harmonious flow of an ivy plant trailing over a wall or the serpentine curve of a garden's edge implies movement in a static garden. A pleasing combination of perennials such as Miscanthus sinensis 'Morning Light', Echinacea 'White Swan' and Sedum 'Mohrchen' repeated along a planting will establish a sense of rhythm as your eye follows it along the border. The camera can teach you which combinations of plants combine effectively to form an artful and pleasing "picture." It will also highlight defects that your eye may overlook, such as unsightly borrowed views of a nearby garage, an electrical wire or pole, or a busy roadway. A section of garden that is not photogenic suggests reworking is in order. Let your eye seek out the patterns around you: wrought iron fencing, pathways, the pattern in a newly mowed lawn, formal geometric beds neatly trimmed with boxwood and punctuated by conical yews, or the rich tapestry of perennials that flow along the length of a border. By learning to recognize the patterns that appeal to you, you will have a better understanding of what shapes, patterns and textures you will want to include in your garden plan. The visual impact of the plants in our landscape can often be overlooked in the urban setting. However, plants provide a sense of well-being and dimension of softness that is infinitely appealing and universally soothing. Colour is the obvious characteristic that defines the mood of a garden, however, form, texture and rhythm will also speak to us as they reinforce the mood of the space. The outline of the plants, pyramid, weeping, creeping, fountain-like, or rounded, must be thoughtfully considered when planning combinations for the border. Over the course of the coming year, together we will explore the forms, textures, moods and movements of the perennials we can include in our border designs with a particular emphasis on the year-round appeal and personality of the plants. Theresa Forte is a garden columnist, photographer and garden consultant.